Easy anti-bacterial household spray Cleans & protects Kills 99.9% of bacteria For use o..
Easy bathroom cleaner Removes limescale & soap scum Leaves a sparkling finish 750ml ..
Easy window & glass cleaner Cleans & polishes glass & mirrors Non-smearing formul..
Easy household kitchen cleaner Kills 99.9% of bacteria Removes grease & grime 750ml .. Morning Fresh Washing Up Liquid 500ml ..
Jeyes Kleen Off Pine Toilet Cleaner Effectively cleans, kills germs and freshens Delivers foa..
General purpose bleach suitable for washroom and general cleaning duties. 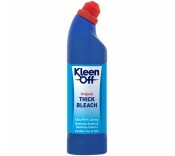 Leaves surfaces clean..
Thickened bleach for extra cleaning power. Cleans surfaces and provides a longer contact for ki..
Hard Surface Cleaner 5 Litre A general purpose cleaner built for cleaning a variety of surfaces.. Powerful disinfectant solution with a fresh pine smell. Disinfects toilets and drains using a n.. Effective liquid detergent for general dishwashing and floor cleaning duties. Can also be used .. Brick and concrete cleaner with a strong acidic base. Breaks down and removes oil stains,genera.. Effective degreaser can be used on coated surfaces with no dulling of paintwork Readily mixes w..
Traffic Film Remover 5 Litre Can be used on all commercial and private vehicles. Ideal for wa..
Jeyes Patio Power Quickly and easily removes mould, mildew, algae, dirt and stubborn stains pav..